Levi Strauss & Co shares started trading again on the New York Stock Exchange recently, after an absence of over 30 years. The company’s Investor Relations site, separate from the other areas of its corporate web estate, carried regulatory news items relating to the IPO, including the final prospectus filed on flotation day. Its Events & Presentations section was and remains, at the time of writing, totally empty. The section is promoted on the IR site landing page, leaving error messages visible to users arriving at the site. An IPO is a stressful time for any IR department and digital manager, and it can be easy for things to slip through the cracks on the IR site – especially if the site, or part of it, is new, and laws about what can and cannot be shown must be navigated. But that does not mean that companies cannot do more to prepare for the day that shares float. 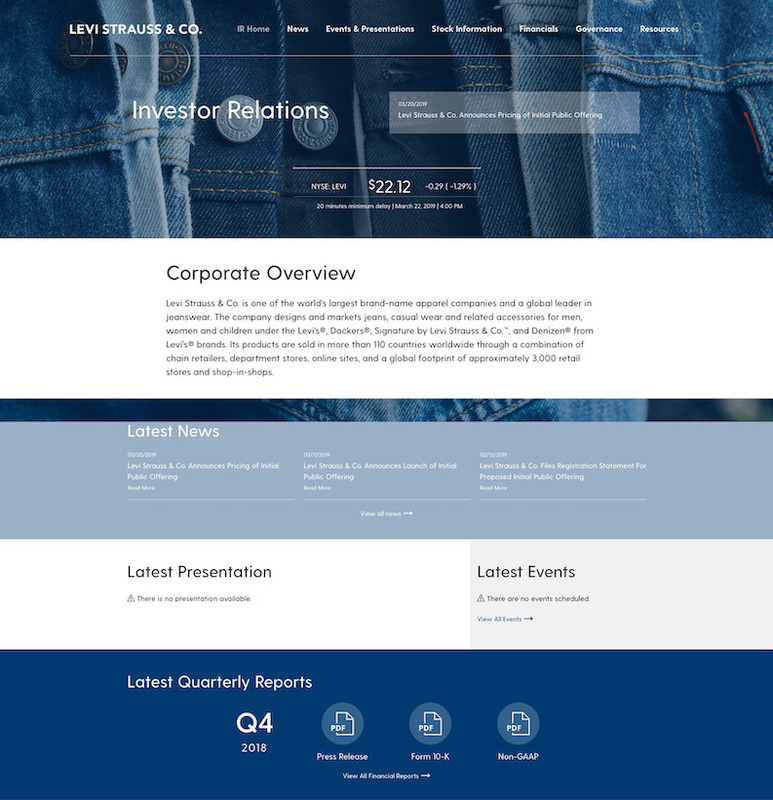 We suspect that the Events & Presentations section on the Levi Strauss & Co site was simply part of a standard template, but clearly it would have been better to remove it until the company had something to put in it; or to create a more elegant message advising users when materials would be available. The prospectus is largely hidden, only available from the SEC Filings area of the site and not in, for example, Financial news. The company should at least point investors to this more obviously now the shares are trading. We would also expect material from the prospectus to be adapted for the website, to state the company’s investment case, in the near future as regulations allow. Sometimes the IPO company has not thought about its IR site and who is going to run it, so that planning should be part of the overall preparations. We know that US companies, encouraged by their legal departments, can outsource their IR sections or sites. If this is the case, it should still be closely overseen by the in-house digital and IR teams. Samsung’s global Investor Relations site, available in English and Korean, has a Governance & CSR section, which contains pages on the company’s six board committees. Each ‘Committee’ page lists its members, with links to individual biographies; and outlines the committee’s responsibilities and duties. Unusually, each of these pages – see the Audit Committee page, for example – has a sub-section called ‘Activities’, which has committee meeting dates, agenda items (along with an indication as to whether each item was approved or not) and the number of committee members present. The information is presented in tables and click-to-expand menus by year, back to 2012. Recording committee meeting dates, agenda items and attendance back to 2012 sends a strong message about Samsung’s approach to governance and transparency, and is a level of detail we have rarely seen in corporate governance sections. The company could go further: agenda points could be explained in more detail (for example, linked to board documentation), and the exact voting results for each motion could be recorded rather than just saying whether they were approved or not. And attendance figures do not reveal exactly which members were present. The biggest problem for these pages is that they are so hard to find: there is a lot of clicking and scrolling required to find them, especially if users start on their local Samsung sites. However, despite not being as well signposted or executed as they could be, including board committee ‘activities’ on corporate sites is an idea worth emulating if the aim is to improve the organization’s reputation for transparency. I have been diving again into the wonderful world of Exxonmobil.com. This is a site I have been baffled by in the past, and my latest look – to update the review in our database – has failed to unbaffle me. But when I say wonderful, I’m not being ironic. In three areas the site shines. First, it is good looking. Energy should be a great source of dramatic images, and here it is. Look for example at the waterfall on the Water landing page under Current issues. Not big, but nice. Second, it is exceptionally well written. The language is crystal clear – even where the subjects are potentially dull, clarity should keep you reading. The way pages are laid out help. With text well spaced, short paragraphs and plenty of bullet points, this is textbook ‘web writing’. Third, there is lots here - great detail in places, and also notably assertive commentary. Linked to that last point, there has been a surge in the company's efforts to get its viewpoint across on controversial subjects. It's well known that ExxonMobil is not first among its peers when it comes to flying the climate change flag. It did not sign up to the recent agreement by other oil majors. But it is trying to use its site (the obvious place to get complex points of view across) to explain what is believes and what it is doing. The home page now has seven panels in view without scrolling (hurrah! ): one with its ‘perspectives on climate change’, two on carbon capture, and others on the environment. Only one, on Liquefied Natural Gas, does not have a ‘we are responsible’ message behind it. The problem is that it is failing to get these views across – or indeed serving any of its audiences well – because the way the site works is little short of insane. I have been trying to work it out, and below I’ll try to explain what may be happening. But for unfortunate visitors trying to find their way around, ExxonMobil.com is Alice in Wonderland rewritten by an out of control machine. If they built refineries like this … well, I hope they don’t. To illustrate, I tried to investigate ExxonMobil’s thoughts on climate. I could have clicked the ‘perspectives on climate change’ link on the home page, but for a more general view I went for Climate, a link under Current Issues in the dropdown panel (the main navigation device). This took me not to the main climate page but to the ‘perspectives on climate change’ bit of it (first confusion). To get to the main page I clicked ‘Climate’ on the breadcrumb trail (hurrah, I thought, there is one). This took me to a nice picture of a field, a single sentence and six menu items, each with a number in brackets (parentheses) after it. The number by each link was one, except for ‘ExxonMobil's perspectives on climate change’ which had 44. What's that about? Anyway, I went to the perspectives page and found a panel at the top with a clear intro sentence followed by four links, the top one being Our position on climate change. I clicked this and came to a concise explanation of the company’s position. Climate change is real, ExxonMobil is doing its best internally and by trying to help its customers, but balancing all the interests is very tricky. But that was all. Below was a panel headed ‘You may also be interested in’ listing two other pages: ‘Encouraging greenhouse gas emissions reductions through responsible use of our products’, and ‘Mitigating greenhouse gas emissions within our own operations’. I clicked them. Both pages were long but clear, explaining in some detail what ExxonMobil is doing. A neat (if slightly confusing) device is a 'menu' to the right that both shows which section you are in on the page, and lets you jump to the others. So I had finally got to two hard bits of editorial. I guessed there must be more; perhaps it was on the '44' page? Unfortunately the breadcrumb trail was no use (it simply had 'Climate', and the name of the current page) so I hit the back button until I found my way to the perspectives on climate change page. And here, once I had started scrolling, I did indeed find so much more. Somewhere between 40 and 50 links; 44 maybe? Though it was hard to count them accurately because some were duplicated. ‘Our position on climate change' appeared three times, for example. The similarity between links titles - and their lack of accuracy - made life even more interesting. 'Lowering emissions' would seem to be a good sub-section heading that would encompass several of the other pages listed in the 44 links, but instead went to a specific page within The Outlook for energy: A view to 2040. But the near-identical 'Reducing emissions' - a link in the dropdown menu under Current issues - led to the page explaining the company's efforts to cut its own greenhouse gases. The Outlook for energy section illustrated illustrated the hopelessness of the affair. Its landing page had a battery of parenthetical numbers. I copped out and clicked the one that let me download the report. This 80 page PDF was, I discovered, much easier to to use than its web counterpart. The numbers in brackets are unfamiliar, unexplained and as far as I can see, unnecessary. There is little prioritisation on the page, and an apparent assumption that visitors will scroll down long pages to find what they want (Jakob Nielsen has demonstrated this is not so). Labelling is often ambiguous and vague. I may not have clicked on ‘Our position on climate change’ if it had been more precise: for example ‘Statement on climate change’. ‘Lowering emissions’ and ‘Reducing emissions’ are both too similar and neither describes its target page well. Some links are wrongly directed (like the Climate link). The breadcrumb trail is neither consistent nor comprehensive. Behind these lies a larger problem. The site appears at first to be built using hierarchies, and the URLs suggest they exist (as do the breadcrumb trails), but it comes across as being close to unstructured. I suspect this is because the mechanism (CMS) is ruling the operators - why else would there be numbers in brackets? - and that they are unwilling or unable to counter its inflexibility. We know there are clever humans there - they are doing all those lovely words and pictures. Now they need to get to grips with the mad machine.